Complaints and annoyances are a part of everyday life. Talking about complaints and annoyances in the classroom is a great way to engage students. It’s a great way to get students to express their feelings and opinions. Textbooks often seem to avoid this great speaking and discussion topic but I find it generates interest, a lot of input and can be a lot of fun. This is an ESL speaking exercise for discussing everyday complaints and annoyances . Students match vocabulary to the pictures. Then they can ask each other the the questions at the bottom of the page. Click on the image below or the link at the right.to download the printable PDF file. 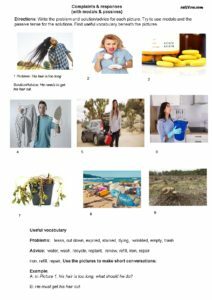 This is a second ESL speaking exercise for talking about everyday annoyances. Students match the phrases on the left to the appropriate pictures. Finally they can have a conversation using the questions at the bottom of the page as a guide. Students write the problem and solution/advice for each picture.They may try to use modals and the passive tense. Each group of students then chooses one of the complaints topics and begins to write complaints as you modeled on the board. Rotate the complaint menus every 3 or 4 minutes so each group gets to work on each menu. In this way they get a feel for the different kind of complaints. STUDENT A(CUSTOMER COMPLAINER): Good day, may I see the complaints menu…..
STUDENT B(TRAVEL SERVICE): Certainly here you are………. STUDENT B(TRAVEL SERVICE): Well,…..I’m sorry but he is new…..
STUDENT B(TRAVEL SERVICE): Yes..but you chose the cheap tour…etc. Finally, select one student out of each group to be the complainer. Give this student one of the complaint menus. The students then begin to role play. An excellent way to get students to rotate to other groups is to play the “Scissors, paper, rock” game. The loser moves to another group. Begin with a list of contemporary annoyances and elicit how they annoy the students. What do you think about…..
ketcup packs you can’t open………. people who talk about soap operas…………. people who steal your answers in class……..
songs that have bad lyrics………. people who crack their fingers to show off…..
blackouts in the middle of good movies……….. It maybe a good idea to review “negative adjectives” and their uses and variations…..
....silly, lazy, impatient, …are annoying,….annoy you,..drive you crazy,…make you mad,…frustrate you,….are frustrating, ..irritate..etc. Model a short discussion conversation and put the students in groups. A: What do you think about people who jump the queue in supermarkets? B: I think they are annoying and they should be scolded. C: On the other hand, it’s ok if they ask first…………..